Tony Cuccio is founder and president of Star Nail Products and Cuccio Naturale. The company also owns Cina Nail Creations (a nail art company), All Season Professional Aspire. 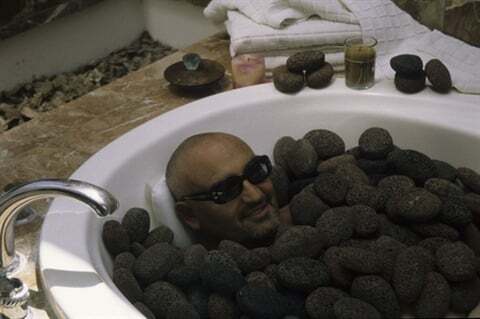 He's pictured in a tub of lava rocks, one of the company's biggest sellers. He's known for his high-energy presentations on salon profitability. His signature look has always been dark sunglasses, but he's as open as anyone in the industry to new ideas and to being approached. While Star Nail president is out in the field, several key women on his staff help the company grow one of the largest nail manufacturers in the world. Here's a little behind the scenes look at them. Star Nail Products has approached distributing their product in a unique and successful way that has shaken up the nail industry. Nestled in the hills of an idyllic California coastal town, this peaceful salon offers a zen-like ambiance for lucky local clients.